Most of the time you will be casting to the shoreline or to a fixed location, your guide will adjust the boat position and proximity based on your casting ability. To help with fatigue, keep your false casting to a minimum. In most cases you will want to cast the fly close to the bank or structure. Try managing your line so that when your fly hits the water you are retrieving the fly immediately. This allows you to cast your flies right up against a bank, into cover and into very shallow water. You can imitate a baitfish swimming out into the open this way. Casting a fly 10 feet off the bank or away from cover does not have the same effect. Peacocks will hang around heavy cover and try to ambush baitfish on the move. If you can master your distance control and line management you will have more opportunities to catch Peacock Bass. Cast aggressively. It is better to hang your flies up on the bank or in a tree occasionally than to err on the safe side all day. Your guide will help you retrieve your flies from any structure. Get aggressive and it will pay off sometime during your day. Like most predator fish you will find that faster retrieves are best especially if you are casting to a school of fish. They will key in on the level of excitement that is created. Start out with fast, aggressive retrieves and then as the fly gets near the boat you can slow it down a bit. Sometimes Peacocks will follow a fly all the way to the boat, so do not get in a hurry to make another cast. Keep your eyes on the water you are fishing for followers. Communication with your fishing partner is also key. The blood runs hot in these fish so if you see them get aggressive, act fast and take advantage of their aggressiveness. If you are not catching fish then experiment with your retrieve and try different speeds. Keep your rod tip in the water or just at the surface. Make a cast and make full arm length hard retrieves, usually as soon as the fly hits the water. In some cases, your guide will tell you to let your fly sink or to use a faster sinking line. In these cases do a countdown before you start your retrieve. This will allow you t0 get a feel for how fast your line is sinking and how long to let it sink before you start your retrieve. The top water fly you are using will dictate how you will make your retrieve. Popper style flies should be stripped hard enough to make a good pop on the water. As soon as they settle, do it again. Top water takes are definitely a reaction bite. The more you get their attention the better chance you have. There are new top water flies coming out all the time. One of the great new patterns is the “Pole Dancer” This fly works back and forth on the surface like a “Zara Spook”. They are meant to be fished a little slower and worked back and forth. This is done by twitching your rod hard as you retrieve. As you get better at the technique you will find that the rod action moves the fly back and forth and your retrieves are just picking up slack as you go. If you get a Peacock to take a top water fly and you miss the strike keep working the fly away from the fish. There is a good chance he will come back for more. The other option is to have the other angler in the boat cast a streamer into the mix and retrieve very fast. Remember, you are not on a stream catching trout. Don’t give these fish the “trout set” When you are retrieving your flies and you feel a strike, the correct way to set the hook is to strip set. This means you pull back with your stripping hand on the fish. Lifting the rod up will not create enough force to bury the hook properly and may even result in breaking your rod. Sometimes smaller Peacocks will short strike your flies as well. If you keep your tip in the water and strip set, it will allow you to keep retrieving if you miss a strike. If you lift your rod tip up you will not be in a position to continue your retrieve. Occasionally you will get a strike, lift your rod and your fly will come to the surface. All of the sudden your fly will get nailed and you will be standing there with your rod in the air and have no chance of setting the hook. Double hook ups are very common. One of our favorite terms in the Amazon is “Buddies”. When an angler hooks up, keep an eye on the battle. Often times smaller fish will school and chase the fish that is hooked up i.e. “Buddies”. When you see this happen, don’t hesitate to cast right in the middle of the action. Sounds crazy but it usually works out and you will catch way more fish if you are ready. Larger fish also tend to swim together. It is not uncommon to see a monster Peacock following a big fish that is hooked up. If you are fishing together as a team a 2nd fly can get into the mix and get a shot at another big fish. So if your fishing partner is fighting a big Peacock make sure you’re ready. If you hear your guide say “bubbles” or “babies” get ready to cast immediately. Peacocks protect their young by carrying them in their mouth. Several times a day they will let the babies out of their mouths to swim around and feed. When they do this the babies will congregate near the surface and feed on the top. It looks like someone dropped an Alka-Seltzer in the water. When your guide sees this he will become very animated and tell you to “CAST, CAST, CAST!”. The best approach is to cast across the bubbles so that you will be retrieving your fly through the babies. Both male and female Peacocks will be guarding the young and when your fly swims through they will eat it. These fish are rarely less than 12 pounds and I have seen fish over 20 pounds caught using this technique. 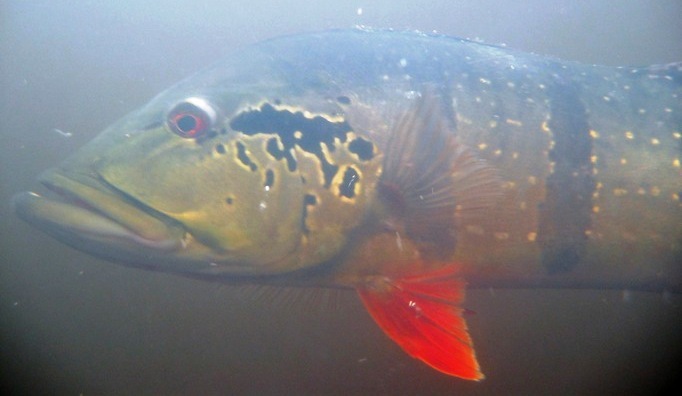 Depending on time of year, you may have a shot at fish still on their spawning beds. Some of the beds look like truck tires and are very large. If your guide says the word “nest” you know he has seen or knows where there are fish on beds. It is very important to get the first cast on the money when this happens. Usually the fish will spook after the first attempt or two. You will come across areas that have lots of beds. It is important to keep an eye out for ones that actually have fish on them. Most of the time the larger Peacocks will make nests in a little deeper water. If you are in one of these areas, don’t focus all your attention against the bank. Sometimes the water that is a little more difficult to see into holds these larger beds and bigger fish. For the most part you won’t have to land many fish on your own. The guides are happy to land and unhook the fish that you catch if you want them to. If you catch something other than a Peacock, do not land it yourself. There are some interesting fish with very large teeth in the Amazon. Peacocks do not have many teeth but their mouths are very, very abrasive. Bass anglers are used to “lipping” their fish. If you do this with a peacock bass you will eventually tear up your hands. Since you will be using leaders that break at over 40 pounds of pull it is easy to feel invincible when you are fighting a fish. IT IS POSSIBLE TO BREAK A ROD by becoming overzealous. When you are putting the screws to a fish be aware of how much bend you have in your rod. Some bend is O.K. but when you are fighting a big fish your rod will break before the leader. You actually are fighting these fish with the strength of the leader as much as you are the rod. This is another reason that gloves are a really good idea. Many anglers have gotten burned, similar to a rope burn, by a large Peacock tearing line through their hand. When it comes down to it, it is a good problem to have!